Nasty ugly scars can result from acne, surgery, and accidents. Scars can also have an emotional impact on our lives and reduce our self confidence. You can not completely erase scars but there is a product that is proven to reduce the appearance of scars. Mederma® Advanced Scar Gel contains Cepalin, a botanical extract which is formulated and clinically shown to soften, smooth and reduce the appearance of scars. I have oily skin and have had acne ever since I was a teenager. Anxiety and stress sometimes causes me to scratch my acne leaving scars behind after it heals. I also have a large scar from two cesarean births. After using Mederma® Advanced Scar Gel for a couple of weeks on my face I noticed the acne scars have softened and are beginning to diminish. My c-section scar is still visible, although I am confident that if I continue to use Mederma® Advanced Scar Gel it will also get softer and improve. 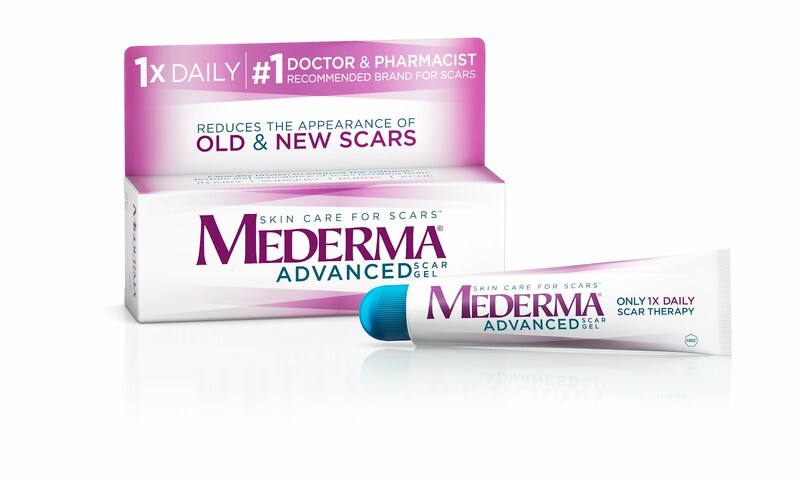 Mederma® Advanced Scar Gel comes in two sizes: a 20 gram tube which retails for about $20 and a 50 gram tube which retails for about $32. Look for them in the first aid aisle of drug stores and mass merchandisers nationwide, as well as online retailers like Amazon.com and drugstore.com. For more information on Mederma® Advanced Scar Gel and other Mederma® products visit them online at mederma.com. *Disclosure: I received a tube of Mederma® Advanced Scar Gel and the Advanced Confidence Survival Kit in exchange for this review. All opinions are accurate and 100% mine. I burned my shoulder with a curling iron, i wonder if mederma gel will soften up my burn mark? The price it;s bad either! If you use this product regularly you will see results within about two weeks. It works on any kind of scars, acne, and burns. Sorry it took me so long to answer all your questions.